“Life and Hope” and Friends of Ziv Medical Center announce their campaign and red carpet event to celebrate humanitarian efforts of Israeli doctors and multi-ethnic health workers across the world, fostering peace through medicine. “Life and Hope” and Friends of Ziv Medical Center announce their campaign to celebrate the humanitarian efforts of Israeli doctors all over the world. “Life and Hope” is a salute to Israel’s medical humanitarian work and a show of support for the Israeli multi-ethnic health workers’ community working in Israeli hospitals, saving life, healing and helping to foster peace through medicine. The “Life and Hope” campaign culminates in a Red Carpet Black Tie Event at the Fontainebleau Miami Beach Hotel, Miami Beach, Florida, on Sunday, December 9, 2018. Between today and the December 9th gala, “Life and Hope” and Friends of Ziv will invest a quarter of a million US dollars to broadcast that Israel is a Humanitarian Aid Country as much as a Start-Up Country and a powerhouse in many other fields. Israeli doctors, based in hospitals across the state of Israel, can be found all over the world, supporting humanitarian efforts wherever they are needed, including assisting the wounded in Syria, supporting Arab-Palestinians and people in calamitous emergency situations in countries from Haiti to Nepal. The aim of the “Life and Hope” campaign is to share the story of Israeli doctors humanitarian work, and to help build a regional rehabilitation center in northern Israel. 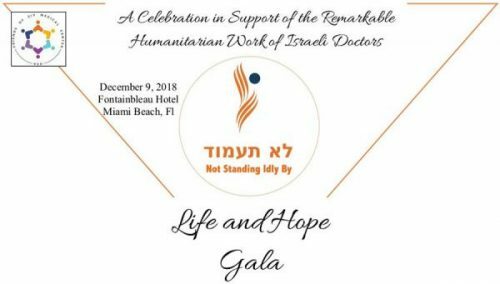 The campaign culminates on December 9th, 2018, at the Fontainbleau Hilton Hotel, in Miami Beach, Florida, where 2000 attendees and distinguished personalities, from all walks of life, will join to celebrate and support the incredible work of Israeli doctors. The new regional rehabilitation center will allow the international community to access the tremendous expertise, experience, knowledge and goodwill of Israeli doctors to help provide a future for the thousands of traumatized children, women and young men who without this help would face a very difficult future. Friends of Ziv asks medical centers and organizations to tell their supporters about the “Life and Hope” campaign and event. As well as curing bodies, Israeli health providers do what politics cannot. They foster love and understanding between people of different nationalities and faiths. This gala is unique, to stand out all by itself. It is meant for participants to be most inspired; a one-of-a-kind gala in which participants will be motivated to celebrate doctors who help all humanity. It aims to bring the world closer together through Humanitarianism. Another goal of the gala is to help Israel elevate her stance in the world, and to advance international coexistence. The Red Carpet, black-tie, star-studded gala, is to be attended by dignitaries and who’s-who and an opportunity to be seen and see, a gala dedicated to the humanitarian work of Israeli doctors. Guests are invited to come and mingle, take a photo with the celebrities and while showing support for the cause! The cause, to put Israel on the global map as a ‘Humanitarian Aid Nation’. Enquiries about Friends of Ziv, “Life and Hope,” from people who care about humanitarianism or have seen the help Israel gives to other countries, people who seek a peaceful world and want to be part of making the world a better place to live should be directed to Nurit Greenger, +1 310-275-2877 (PST). For more information about the Life & Hope Red Carpet Gala visit the link above.